So it was raining heavily for the last few days and I went out in search of puddles on the street to reflect something of from. The reflections always came out blurry because rain was falling on the water all the time. The solution of this problem - shoot under a bridge, which is what you see on the upper right part of the photo. 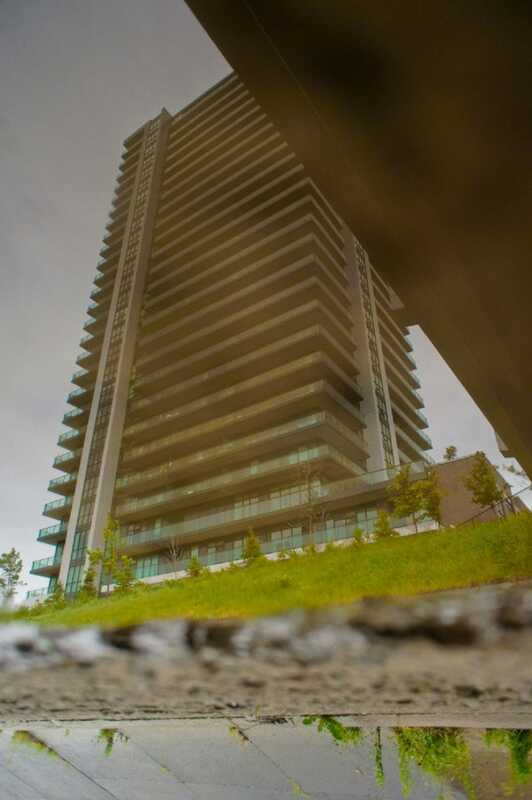 Shot with a wide aperture to blur out the muddy water and to focus just on the building. The photo was turned upside down in post and a little Adobe Lightroom color correction. Its amazing how a tiny surface can reflect a whole building if you get close enough. Tech stuff: f2.8, 16mm, 1/640sec, ISO400. "For this shot I had been playing around with the moon and my tripod all night and i managed to snap this stunning picture. I think the brightness of the moon (no editing) is just incredible. My tripod actually broke after this photo so i had good timing! Looks like George drove his car into a lake and the fish is coming to help him or eat him. Of course George is safe outside the fish tank, actually looking at the fish's tail. This photo was taken on the streets of Chicago around midnight. I was walking home from the bar and noticed this reflection in the street. I thought it would make a perfect shot for this weeks challenge. I love these contests because it makes you think of photo opportunities you would have just walked right past. I took this photo Sunday afternoon at the Japanese Garden Pond at Brooklyn Botanic Garden. I figure there might be a lot of headstands at work when the results come in on Tuesday, so I rotated my shot 180 degrees. I adjusted the contrast, brightness and curves in Photoshop. Fujifilm X10, f/4.5, 1/500, ISO 400, EV -0.3 and equivalent focal length of around 78mm. This was taken with a Nikon D3000 in the predawn hour after a severe thunderstorm. ISO of 1600, all else set on auto this time. I had a different photo picked out to submit here this morning but I had to run out to the drugstore this morning and noticed how surreal these trees looked in the hyperdimension of the puddles so I grabbed the camera and started trying to capture it. Of course being around 5 am in a closed supermarket parking lot, yes I did get questioned. They were nice about it though, asked me if I was waiting for the store to open. I explained I was photographing their most excellent puddles. I love playing with photo reflections and am submitting this one I captured with my Olympus 8010 Tough - a simple enough camera with some amazing output. One of the other things I like to do with a camera is to shoot miniature landscapes and waterways. While at an abandoned house foundation excavation, that had begun to fill with water from a tiny creek, I saw this small island in the middle of the still pool that had formed in the pit. The sun was out and the wind was perfectly still, so the reflection opportunity was optimal. I moved around to find the little island "floating" in the reflection of the trees nearby and turned the camera upside-down and framed the shot to show only a sliver of the actual shore. If you rotate the shot 180 degrees, you'll see it as I was standing on the shore. A few times a year I go visit my grandparents at their house in South Carolina. Behind their house is a lagoon surrounded by tall pine trees. The previous day, tropical storm Beryl just passed by so it was a wonderfully clear day and everything was reflecting perfectly off the water. A light breeze on the lagoon caused a few ripples to appear. Taken with my Nikon D90 ISO 500 and it was a 18-70 mm Nikkor lens 1:3-4.5. This is the real story behind this reflection photo. The photo is the last frame of a timelapse I was shooting just before I had to pull it out of the rising tide. I was getting tired of waiting for the partial lunar eclipse in the backyard and decided instead to shoot the full moon reflected in the pool (a first for me). This is a photograph of Tempe Town Lake. It's the largest body of water around Phoenix, so it was naturally the best place to shoot for this challenge. sorts) here in San Francisco - to see if I could get lucky. of f/6.3. I didn't use a tripod. And the windows were dirty. You'd think the non-stop rain here in Boston would have helped for this challenge, but the winds have made every pool of water (including the large reflecting pool near Prudential Center) not very 'reflective'. I got this shot near Post Office square in downtown Boston (in the 20 minutes it didn't rain on Saturday). This was shot in Millennium Park, Chicago. After 11pm the city turns off the Crown Fountain; leaving a dark, wet surface with a full moon and some city lights. I ventured out with my T2i and tripod - in the hopes of finding just such a situation. Took a couple shots to get exposure where I wanted it. ISO400 @f14 for 10seconds just about did it. I've been wanting to participate for quite sometime, as expected this was a lot of fun. I'll definitely be participating again soon. My name is Boris Perez and this photo was about a leaf, because if you left rotate this picture, it looks like a leaf. Also, the sky was really like "before rain"… so it was interesting to take. I was on my way to bed and still had nothing at the end of a busy weekend. I looked down and saw my reflection in the counter top and realized I could use that as a backdrop. I chose the Bacardi mini bottle because I wanted something with sharp lines that was small enough to allow me to cut the bathroom out of the shot, and the Lego Minifigs to give it some scale. Touched up the channels a bit in Photoshop. Took this picture with my iPhone 4 - The sunset is reflecting on the lake behind my apartment in Pompano Beach Florida; Open the picture in Photoshop, turn it upside down so all you see is actually the reflection, resize it and this is it. effect. It's kind of a ghostly fish too. I took this picture while spending a beautiful Saturday afternoon with friends in Rittenhouse Park in center city Philadelphia. There was a farmers' market and art show going on so it provided the perfect opportunity to people watch and soak in the day. Shot with Canon Rebel T3i with 18-135 lens. Aperture-Priority, Auto ISO, f/9.0, Shutter Speed 1/250, ISO 2000, focal length 135mm. Agua Calente Park is in Tucson, Arizona. It is a peaceful oasis in the desert, the first place I thought of when I was thinking about where to capture reflections in our part of the world. Rain puddles are rare this time of year! Parade viewers lined the street despite the rainy day; their reflection captured in this tuba player's horn. The white trouser of the musician extends perpendicular to the white stripe reflected from the road and guiding the band down the Parade route. The sun is trying to peak through the clouds and reward those who came out to watch. Canon 7D with EF 24-105 at f/10.0 for 1/160 sec and ISO 100. I went for a walk to the Belvedere Castle in Central Park, NY. The picture is taken from a dock off of Turtle Pond. There are literally hundreds of turtles, ridiculous.The turtles actually kept messing up the reflection part of my picture by causing ripples in the pond. I wanted to punch them. Haha, I would never do that. ;) It was a stormy day, so I set my ISO to 400 on my Cannon T3i with a 18-55mm lens. Taken from a small pedestrian bridge over the Mississippi in Minneapolis looking at the I-35W Saint Anthony Falls and Stone Arch bridges through the 10th Avenue bridge. The vivid color blue against the orangish hue of the shop interior and maps initially attracted me to this window. When framing the shot, there happened to be some tourists there taking their photo (with the naked statue man who watches over Oxford in the background), so I moved to center them in the blue part of the window, as they nicely filled that blank space. It wasn't until after I snapped the photo that I could see just how reflective of the blue part of the window was, and in contrast, the transparency of the other parts of the window. This contrast in reflection is what led me to choose this photo for submission. The Kenilworth Park & Aquatic Gardens is so beautiful, I had no idea that this wonderful place was in the middle of DC. I shot this with my Canon T3i, with an ISO of 200 at F-22 and a shutter speed of 1/13. It seems Her Majesty forgot to order in the sunshine for Her Jubilee weekend, so reflections were pretty much limited to puddles or indoors today. I chose the latter with this shot of a woman in red admiring the shrunken heads (really!) in Oxford's Pitt Rivers Museum, and almost everything you see is a reflection. Even though I was clearly there and behind the camera, it makes me a little cross-eyed trying to figure out the reality of the scene. Canon EOS 550D with Canon EF 50mm f/1.8 II lens. ISO1600, 50mm, -0.3EV, f/1.8, 1/25. I knew I wanted to photograph one of Paris' landmarks for this contest. After taking the Eiffel tower, Arc de Triumph and a few others off the list, I settled for the Arche de la Défense in the middle of the financial district. I brought a bottle of water with me thinking I could pour some on the ground and have a nice reflection waiting for me shoot. After about 5 very unsuccessful attempts, I gave up and remembered there was a fountain a little further away. I shot about 100 photos and settled for the one with the best reflections, and almost-symetrical sun rays and fountain tiles. This fortuitous framing is a shot of Mucca Pazza, the "circus punk marching band" from Chicago, perfoming in Nashville on the opening date of this year's Tour de Fat, a celebration of bikes and beers coming to a city near you (or not). Nikon D70s with Nikkor 70-300mm @ 100mm, ISO 200, 1/350sec @ f/4.2. Rain, big puddles, and my wife helped me capture my 9 month old daughter with her first ponytail. It rained almost all day Sunday with a few brief sunny breaks. In between downpours I was able to get this shot. We tried up on the sidewalk first, but the puddle was not deep enough. We moved into the street to get a really good reflection. Lesson learned, the deeper the puddle, the better the reflection. I used Aperture for some color correction, boosted the saturation of the pinks and greens and tried to bring out the color in the puddle. I added a little vignetting as well. Canon T3i, Canon EF 50mm f1.8 II - shot at f2.2, ISO 100, 1/200. How to do a reflection without a mirror or glass orb. The most obvious way is to use water. I played with the idea of trying to do it off the surface of a car, but after a couple of attempts I gave up and decided on water. Being that I am in southern Arizona, and we have been in drought conditions for more than 10 years, this is not that easy to do. Near by are some fields that are irrigated in order for the property owner to maintain their water rights. So there are always wet spots near by. I went early in the morning to see what I can find in the way of reflections. Saw a lot of wildlife, but generally, the water was being blown around too much by the wind to make a good reflection. Giving up, I decided to head back home to see if I could make any of the shots work. That is when water near a line of trees, in some grasses, was rather smooth. The reflection is broken by the vegetation growing through the water, but it gave me a good reflection of the cottonwood trees, sky, and mountains in the back ground. I call this one... "Monet Flowers in Dented Garbage Can" since that's what this is. Actually timed it nicely to get some direct sunlight in from my kitchen window. I used a shallow depth of field to enhance the out of focus blur.